UPDATE: I plugged the numbers into Random.org and a winner has been chosen! The winner is comment #14! Kate said, “I’ve tried a bunch of Nicole’s recipes – they’re always a hit. The baked blooming onion is one of my favorites! Her Slow Cooker Cuban Pork Tacos with Jicama Slaw are on my shortlist to try soon.” So check your email Kate! If the prize isn’t claimed within 5 days a new winner will be selected. Thank you for all of your entries! It was awesome celebrating Nicole’s new cookbook! I know I say it all the time, but one of the best parts about blogging is creating connections and friendships with fellow bloggers. It’s so fun to be connected with so many people spread across the United States, people that would otherwise be complete strangers if it weren’t for this weird hobby I have making food and taking pictures of it. The coolest is part is that these people get me. They don’t bat an eye when we meet in “real life” for the first time and I take a picture of my grilled cheese sandwich. And I don’t bat an eye at them taking pictures of their food either. Nicole is one of those friends. We first met in person at the Foodbuzz Festival in San Francisco and we instantly clicked. Like we had known each other for years! I was absolutely thrilled to get to see her again a few weekends ago when a group of awesome Chicago foodies and bloggers welcomed me to the area with a brunch and baby shower. Needless to say, when Nicole announced that she was writing a cookbook, I was thrilled!! She has such an amazing vision when it comes to food and health. Her focus is on healthy eating without sacrificing taste and flavor. She’s a registered dietician that believes in balance and that “an ounce of prevention is worth a pound of cure”. 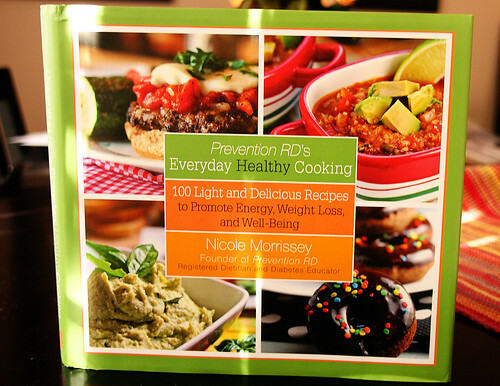 I absolutely LOVE her blog, Prevention RD, and I knew I would love her cookbook just as much. And I was right. Each recipe has an awesome and large photo, easy to follow ingredients and directions, nutrition information, and a comment from Nicole herself! The cookbook is also packed full of recipes for everything from appetizers to main course dishes and even (healthy!) desserts! You must check it out! I selected a recipe from the cookbook to make and share with my readers! I love this recipe because it uses ONE pot and it comes together super quickly. I have a week and half old baby and I was still able to whip together this dinner in no time. Thanks so much Nicole! And here’s more good news! I have a copy of this awesome cookbook to giveaway to one lucky reader! Here’s the details! Giveaway closed and winner announced! Pay a visit to Nicole’s blog then head back here and leave a comment answering the question telling a recipe of Nicole’s that you would like to (or already have!) tried! The winner will receive an email from me (so be sure to enter your correct email address!) and will have 5 days to respond. If no response is received, a new winner will be chosen. I was offered a copy to review and a copy to giveaway by Nicole’s publisher. However, the opinions and review are my own! In a large 12-inch nonstick skillet, heat olive oil over medium heat. 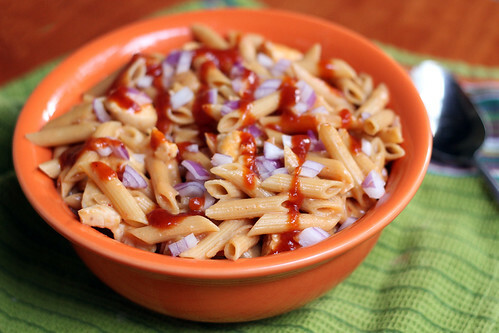 When hot, add chicken and onions, and saute, stirring occasionally, until chicken is browned and cooked through. Transfer chicken and onions to a plate and set aside. In the same skillet, add water, chicken broth, penne, and salt. Bring to a boil, and simmer 12-15 minutes, until liquid is almost absorbed, pasta is tender, and mixture is thick and syrupy. 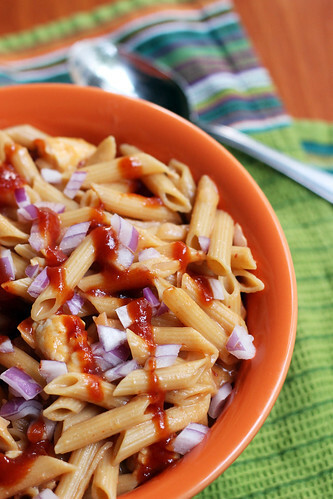 Stir in barbecue sauce and Greek yogurt. Once mixed, add reserved chicken, onions, and shredded cheese. Stir to combine and cook until everything is heated through. Serve immediately and garnish with additional red or green onions.